Post coup demonstrations. Students with bananas in street, rock car, tires in streets, students on tanks. Reaction to Diem coup, car in flames. On cinema sign, dismantle cinema billboards. 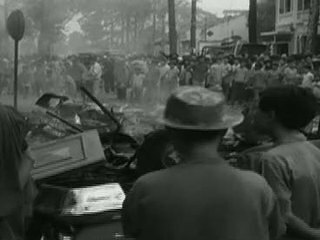 Chicago: “Vietnam: A Television History; America's Mandarin (1954 - 1963); Diem Coup Street Demos [Part 2 of 2],” 11/02/1963, WGBH Media Library & Archives, accessed April 25, 2019, http://openvault.wgbh.org/catalog/V_75AACE77489242A8B50B770CCAB7BD9F. MLA: “Vietnam: A Television History; America's Mandarin (1954 - 1963); Diem Coup Street Demos [Part 2 of 2].” 11/02/1963. WGBH Media Library & Archives. Web. April 25, 2019. <http://openvault.wgbh.org/catalog/V_75AACE77489242A8B50B770CCAB7BD9F>.